Paradigm: The typical way of thinking something. Example: In 1491, the earth was flat. Paradigm Shift: To change one’s thinking to a different way of doing something. Example: In 1492, Columbus sailed the ocean blue. 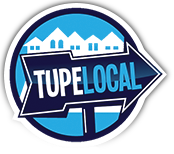 TupeLocal is a locally owned and operated company that is here to help both the consumer and the local business owner to come together. Backed by over 15 years of advertising and marketing experience, TupeLocal was founded to bring Tupelo and all of Northeast Mississippi some consolidation, consistency, common sense and customer service. TupeLocal brings CONSOLIDATION. Often, searching for something will take you in 10 different directions. We have it all in one place. TupeLocal brings CONSISTENCY. Dependability and reliability are what make a good company great. We are here to work with businesses to make their advertising consistent. We are here to take their web advertising from good to great. TupeLocal brings COMMON SENSE. There is an old saying: If it walks like a duck, talks like a duck and looks like a duck, it is most likely a duck. We are not here to make you what you are not. We are here to show who you are. We are here to show clients that it just makes sense to shop in Tupelo. TupeLocal brings CUSTOMER SERVICE. With the advent of the internet and the fast-paced life that it seems we have to have now, customer service has definitely taken a backseat. At TupeLocal, we strive to make each local business and each customer #1. It is time for that paradigm shift in Tupelo. It is time for all of us to look to Tupelo for our needs. Let’s stop going to Memphis for a car. Let’s stop going to Birmingham for clothes. Let’s look to Tupelo for what we need. Whether you are new or have lived in Northeast Mississippi for 50 years, TupeLocal is for you. Whether you have been open 1 month or 50 years, TupeLocal is for you.